As the end of December approached I was engaged in the normal pre-festive arrangements but also thinking of how and where I might fit in my final night out of the year. Amongst the advantages of moving to Aviemore I'd weighed up that we'd be much closer to the North West coast and yet hadn't quite made it through since we moved. This seemed like an excellent opportunity to correct that oversight. Looking around at a suitable bike route did, however, make things a bit more complicated and I eventually settled on a plan of camping one night and doing a separate, unladen, ride along the northernmost section of the Highland Trail route the following day. 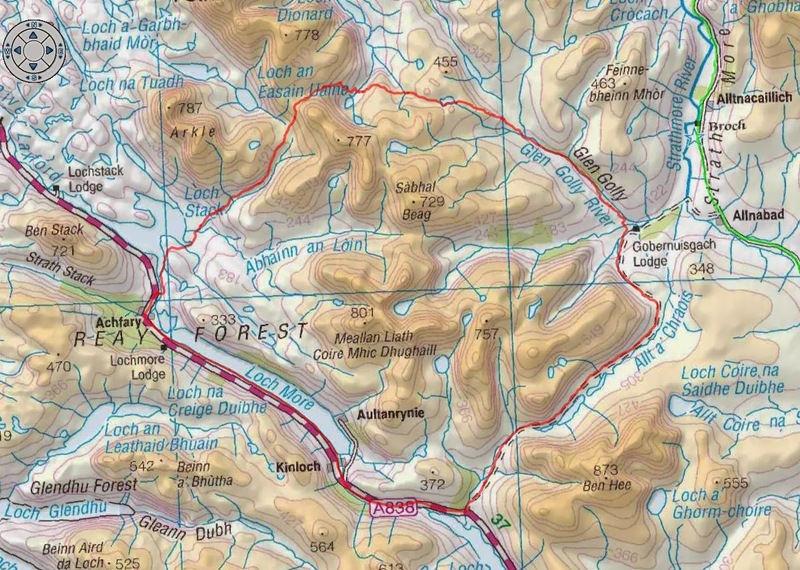 A wee bit of googling suggested that I might find a nice spot at Achnahaird just north of Ullapool. Getting there was an easy drive but I was determined to not simply pitch outside the van so I'd loaded all the backpacking requirements into a recently-acquired rucksack figuring I'd give that a wee test too. Heading off in the dark, albeit with a headtorch was a bit daunting on account of the cliffs I knew were nearby but by keeping an ear open and scanning the horizon as I went I was able to make it down to the flatter, less rocky round near the beach. I managed to find a reasonably sheltered pitch and settled down to listen to the breakers and look at the stars overhead. I'd brought the tent rather than the bivvy bag but ended up lying mostly outside of it for a good part of the night. A fairly good night followed but I was awoken just before 7am by the noise of the wind - and the flapping of the tent. The wind direction had turned overnight and was now full-on into the doorway. Rather than struggle trying to get everything sorted again I decided to just strike camp immediately and made my way back to the van before preparing breakfast. The drive round the coast to the start point of the ride at Achfary was interesting enough. The roads are narrow and windy and the by-now near gale force winds were threatening to have me in a ditch. Things hadn't improved any by the time I reached the little parking spot at the end of the road to Lone. As I sat in the van I could feel it rock and standing outside confirmed it was both cold and damp. Frankly, the prospect of heading into some of the UKs most remote countryside with a forecast of low cloud and the occasional snow shower was feeling somewhat daunting and I swithered about simply heading back home, maybe stopping somewhere more sheltered for a ride. Eventually, I gathered up the courage to get dressed, get my stuff together onto the bike and set off down the road to West Merkland. I'd originally hoped that this would be a nice wee warm-up but I was now heading straight into the wind and as I got alongside Loch Stack the exposure meant I was struggling to make anything beyond walking pace. Almost an hour later I reached the end of the track that would take me north. Although I was still a little reluctant, I was happy to have the wind behind me for a while and the climb up to the watershed started OK. However, it wasn't long before I was again being severely buffeted as the wind swirled amongst the neighbouring peaks. Happy to reach the end of the climb it was finally time to enjoy the long and fast descent to Gobernuisgach. Just before the lodge I noticed a new bridge off to the left, marking the start of the second half of the loop. I was just two hours into it now, but I knew that the hardest section was still before me. The track along Glen Golly looked OK, wider and in better condition than I'd expected. However, the record December rainfall had made the whole thing completely soggy and I found the tyres were churning it up, impeding progress. I was frequently on and off the bike, chancing my arm for a bit before the front wheel would sink into axle-deep mud. By now, it was well into the afternoon and I was starting to calculate how far I'd get in the remaining daylight. I reckoned that my target had to be the Bealach Horn, leaving me just the downhill to the van to complete by torchlight. The end of Glen Golly was marked by a steep zig-zag climb up Creag Dubh which was a push all the way. A short section of more muddy track took me to within sight of the Bealach Horn but the track was fast deteriorating and I was walking more than riding. Meall Horn looked awesome, with the cliffs falling away to the two lochans but after my initial excitement at the thought of a bit of downhill riding I was more and more aware of the fact that I'd have to climb out of the glen in front of me. The track was also becoming increasingly difficult to follow as it fell away over deep peat hags. I was having to drop the bike down in front of me then jump down into the soft peat before lifting up to the next piece of "solid" ground, all the time aware of the darkening sky. The final obstacle was the Allt an Easain Ghil, the outflow from the lochan I'd spotted earlier. It looked like there would be a simple way across in shallower waters but it took me a few minutes to get across the slimy rocks using the bike to steady myself. That took me to the fairly decent estate track up to the bealach which I was, again, having to push up. A few false summits went past and some sections of track were knee deep in snow but I made it just before the last of the daylight faded away. What followed, I still don't understand. What should have been a fast, balls-out descent back to Lone was, instead, a complete mince-fest. It felt like my bike was trying to throw me off. I couldn't tell if it was tyre pressures or something loose but I'd have sworn someone had put a hinge in the middle of the frame and I was struggling to keep it pointing in a straight line. This was particularly a problem due to the steep drop on my left and the fact that I was, by now, mostly operating by torchlight. I was just relieved to be able make out the occasional car headlamp in the distance, a sure sign that I was at least getting to a reasonable distance of the van and even more relieved when the track levelled out again for the final section - through a herd of deer - to the road. In all, it had taken me 6 hours to complete the 47km circuit. About an hour of that was stationary at various points and an hour was on the initial 13km road section. On the way home, I cajoled myself with the notion that the rest of the Highland Trail route couldn't be any tougher...could it?